The following article submission was originally published in The Bridgton News. It was requested by a member of the local American Legion to reprint this article as an informative piece regarding an often misconception faced by those who park in handicapped spots. Author, Kelly Ela has also given us permission to reprint. many veterans, struggle to deal with a disease that is slowly killing me on the inside. It doesn’t matter how fine I look on the outside. The pure ignorance of humanity can take a big toll on some of us. We aren’t always the strong Soldiers, Sailors, Airmen, Marines and Coastguardsmen we used to be. I ignored the man and dragged my tall, proud, grotesquely scarred, PTSD engulfed, medication filled, bullet hole healed, blood clot ridden, body with barely functioning kidneys and lungs that happens to be short of a few organs, into the store, so that I could feed my family with three small children waiting at home. That, my friends, is why I have a disabled Veteran plate. This is what inspired me to write, “The boots”. ATTENN HUTTTT!!!! You step off that bus to the screams and spit blaring from the mouth of the drill instructors and it is at that point, life as you know it just changed. As the days in hell progress, you are all issued a pair of tall black boots. These boots will quickly become your lifeline and you will never leave without them. You will lace them, shine them, learn how to march diligently and precisely in them. When they get dirty you will clean them and proudly shine them again. You will stand for hours and hours in them. You will do pushups until you puke in them. You will eat in them, you will sleep in them, you will sweat and bleed on them, you will make friends for life in them. They will get wet and give you blisters that make you cringe, but you will keep on marching proudly in them. You will train hard and learn to defend yourself and America in them. They will protect your feet as you carry your weapons, bags and fatigued bodies across the mountains, deserts, oceans and more. These are the same boots peeking out from under the white cotton cloth of a soldier just killed in the battlefield. The same boots standing atop a makeshift memorial holding the rifle and dog tags of our sister who just paid the ultimate sacrifice. These are the boots of a United States Veteran. All of us wore these boots and stood proudly taking the same oath to defend the Constitution of the United States of America under the Red White and Blue of Old Glory. There is no person more proud than a Veteran wearing those tall black boots. As each of us moved through our military careers, we traveled the world. We saw the beauty world had to offer. We saw the terror and awful sights the world also offered. Those boots stood witness with us. As we fell, they fell, as we advanced, they advanced. When we deployed, those boots deployed with us; we never left without our boots. We left our husbands and wives, our children, and friends. Over and over we left to stand the endless watch of freedom wearing those tall black boots. As time progressed, each of us were ordered down a different path. Some of us injured on the outside and lost or maimed our limbs. Some of us injured our backs and necks. Some of us burned unrecognizable, while some of us received mental injuries. All while wearing the same boots as our brothers and sisters. Some of us were unknowingly exposed to agents and poisons resulting in cancer, and diseases with no cure, all while wearing those boots. Some of us received injuries so great, that those boots had to be put on a shelf below a flag, never to be worn again. The one thing that stands true is those black boots were worn by every United States Veteran, fighting to defend our country. It doesn’t matter what branch of service. It doesn’t matter if they were on the feet of a man or a woman, young or old. At one point they were laced up and cared for with pride like no other. 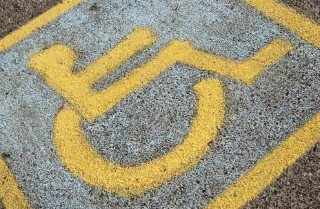 Our disabilities may all be different and not always seen on the outside. They were all acquired performing the same mission, while wearing those same tall black boots. So next time you go to judge that disabled veteran that looks “fine” on the outside, take a moment to look at his or her feet and remember. At one time, he or she strapped up those boots for your freedom and is now paying the price with no regret. God Bless America.